I’ve been researching the global warming debate since April 2009. I’m still fitting together the pieces of this multi-dimensional puzzle. The big picture hasn’t yet come fully into focus. But I am now certain of one thing. Climate change skepticism is free speech. Some people disagree with climate skepticism. Good for them. But that doesn’t give them the right to deny their friends, neighbors, or fellow citizens the opportunity to hear about it. In democracies, various parties present their ideas and the public gets to choose from amongst competing analyses and visions. At election time, all who meet minimum criteria are allowed to participate – to argue their case before the electorate. We’d take a dim view of any candidate who insisted that one or more of his opponents should be prevented from running for office. 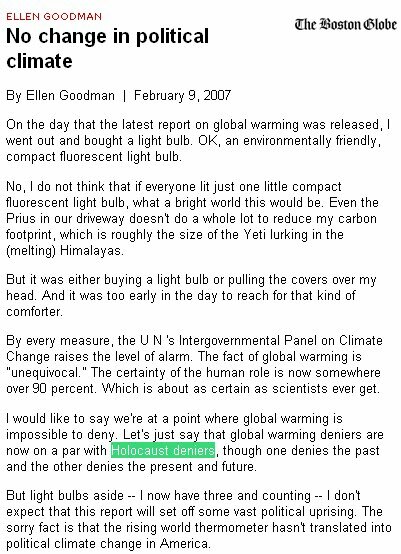 Boston Globe column by Ellen Goodman, dated Feb. 9, 2007. They strive hard, in other words, to disqualify skeptics from the race itself – to convince the world that skeptics are too evil or unstable to even be permitted to take part. Global warming proponents are, therefore, trying to cheat. Rather than competing against the skeptics on an even playing field, out in the open, so that the public can make its own decisions, they insist theirs is the only perspective that deserves to be heard, that anything else amounts to “subverting public understanding” – an Orwellian turn of phrase if ever there was one. Not everyone who believes in global warming acts this way. But those who are appalled by such behavior need to speak up. 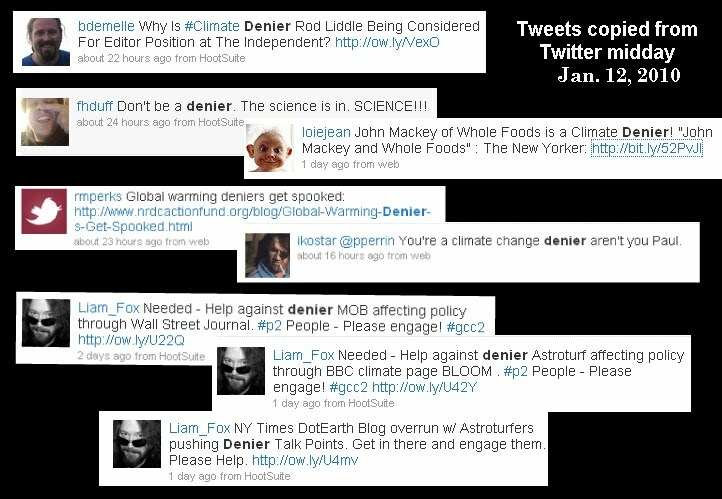 Every time we hear the words “denier” or “denialist” in a climate context we need to distance ourselves from such pejorative, silencing language. We need to declare, loudly, that all points of view have a right to be heard – that climate change skepticism is, in fact, free speech. This entry was posted on January 11, 2010 by Donna Laframboise in free speech and tagged denier, Ellen Goodman, free speech, Holocaust deniers, intellectual freedom, Rolling Stone magazine.